Good. what more can we ask for beyond the existing laws being enforced. I think even the Liberals cannot complain about that but I'm sure they will. This is such a ridiculous debate. Both types of people have hopes and dreams of a good life in America but there is a right way and a wrong way to do it. People that start off their American Dream by breaking the law are prone to break the law down the road because they have nothing to lose whereas the legal immigrant knows that if they break the law they could be sent packing. Why are the Dems so crazy to protect the illegal aliens while turning their backs on legal immigrants and citizens? I think it's mostly about votes for the Democrats. They are pandering to a group of citizens that don't want their friends and relatives here deported and want the flow to continue from their ethnic/national group. Some illegal aliens are known to vote and they vote Democrat also. It's getting to the point that these illegals trying to cross will be labeled as invaders and shot on sight. The situation is very sad. South American countries need to get their acts together. It's getting to the point that these illegals trying to cross will be labeled as invaders and shot on sight. Oh no, you don't get it. Shooting them would be counterproductive. Allow me to call your attention to two data points. 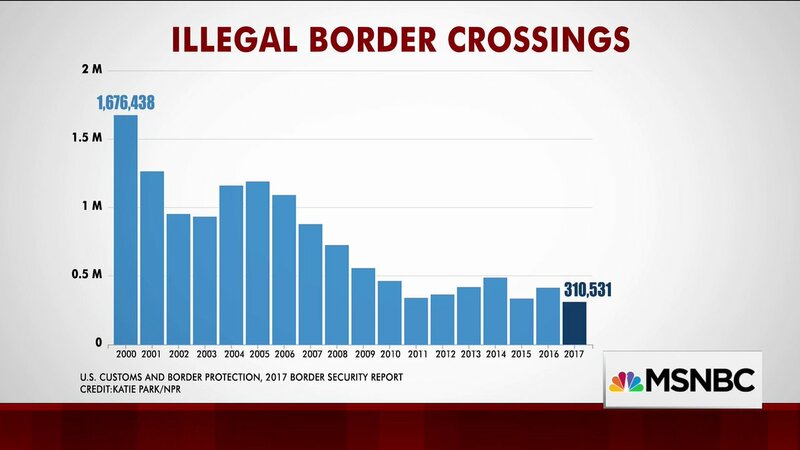 1) Illegal crossings are actually way down on the average. 2) Trump made big promises during his campaign to the private prison lobby in return for big contributions. But since crossings are way down, too many empty cells. Actually, if you read the link I provided it said that illegal crossings are up 203% since March of 1917. Correction -should have been 2017.